Praise for Previous Work "Peterson is one of our most valuable poet-thinkers and thinker-poets, a writer who can show us how much is within our grasp and much is beyond it." --LA Review of Books "His observing eye, as astute as the most finely honed telephoto lens, is such that he's able to transform even the ordinary into something so exquisite it provokes wonder and awe." --Mary Jo Bang "Like 'Brazil's undiscovered caverns of amethyst, ' Allan Peterson's Fragile Acts is a major find." --John Ashbery "He puts music to the tension between the desperate human experience and the cool removal of the cosmos. His poems are refreshingly discrete artifacts--perfected and edgy--raw at the same time." --Laura Kasischke "Allan Peterson's meditations on domestic tranquility and ecocatastrophe are so smart that they could actually make you smarter." --Boston Review "Soul-poppingly magnetic." 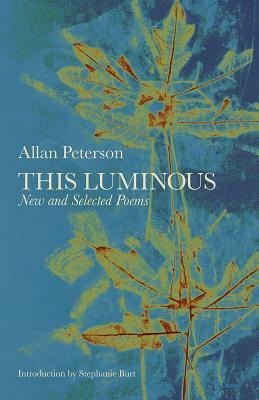 --The Rumpus From the vast complexities of a world in which synesthesia is our natural translator, Allan Peterson's poems convey the consistent message that the ordinary isn't. Selected from books and chapbooks covering almost thirty years of writing, Peterson's work draws heavily from landscapes like the Gulf Coast, the sciences, history, and the author's background in visual arts. Details of perception and observation demonstrate why these reflective works, often dense with images and intuitive jumps, have received national and international recognition.